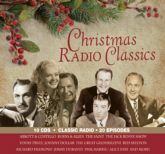 Come back to the tradition and warmth of Christmas in the Golden Age of Radio, with the great performers and shows of yesteryear. Go shopping with Jack Benny. Go to the snow covered woods with Johnny Dollar. Go to Bethlehem with Family Theater. The voices of Vincent Price, George & Gracie, Bergen & McCarthy, Abbott & Costello, Red Skelton, Jimmy Durante, and more are lifted in story and song. They celebrate the yuletide with equal parts hope and hokum, silliness and sacrifice, merriment and mystery. Share the holidays with all your old time radio favorites in 23 digitally restored and remastered episodes.